Many of us use the excuses: “I don’t have time,” or “I don’t belong to a gym,” when we feel guilty for not working out as much as we “should.” Now that the holidays are approaching, these excuses are likely to be even more handy—you can easily wave off the prospect of a post-work workout since you have to hop on a plane to visit your folks for Thanksgiving. Or, you’re staying at your parent’s house and don’t have access to a gym. Or, maybe you’re so busy holiday shopping that you don’t have an hour to get to the gym, actually (gasp!) exercise, and then travel back home. To help you bust those excuses and stay in shape all season long, we talked to New York Sports Club trainers Edem Tsakpoe and Ken Szekretar to get a workout for every time frame—whether you have 10 minutes or an hour. The best part: these can all be done in the comfort of your home—or your parent’s basement. So, how much time do you have today to work out? Be honest, then get moving on the workout below that fits that timeframe. Warmup: Run in place for 30 seconds, then do alternating side lunges for 30 seconds, arm across chest triceps stretch for 20 seconds each, and finally 8 repetitions of deep body-weight squats. Workout instructions: In Set 1, do 10 jumping jacks and one repetition of exercises 2, 3 and 4. In Set 2, do 10 jumping jacks and 2 repetitions of exercises 2, 3 and 4. Continue the sequence of progressively adding one repetition to exercises 2, 3 and 4 until 10 minutes of activity is complete. Cool down with a stretch of tight and overactive muscles. Warmup: Perform 4-6 minutes of either jumping rope or jumping jacks as 45 seconds of work followed by a brief 15 second rest. Start the first 45 seconds at an easy intensity and for each successive minute go at a bit higher intensity. Workout Instructions: Alternate between the core exercises and cardio exercises, doing two to four rounds of each of the exercises with 30 to 60 seconds rest in between rounds. If you are just starting out, start with four rounds of 30 seconds per exercise. If you are a bit stronger already, try for 60 seconds per exercise doing just two rounds. This will be a more challenging version of the routine. Either way it’s just 12 minutes of nonstop work which will leave you feeling the burn. Workout Instructions: Do each of the exercises for 60 seconds before going straight in to the next one. Once the circuit has been completed you can rest up to one minute (if needed) before going in to the second round. 1) 60 seconds of lateral jumps – Imagine a line on the ground beneath you and jump side to side over it keeping your feet together. 2) 60 seconds of squat jumps – If these become too difficult regress to a basic body weight squat to finish out the minute. 3) 60 seconds of sprinters crunch – Perform a half bicycle crunch but bring your entire upper body off the floor. Do 5 reps to one side before switching to the other. 4) 60 seconds of high knee running in place – Be sure to bring your knees up to hip height and stay tall throughout the exercise. 5) 60 seconds of skaters – Lateral hops from one foot to the other, landing on the outside foot. 6) 30 seconds on each side in a side plank to star position – Bring yourself up to a side plank while resting on your forearm and elbow. Once in position, bring your top foot up in the air so it is about 12 inches above the bottom foot. Hold for 5 seconds before lowering. Do 5 reps on one side before switching to the other for 5 more. 7) 60 seconds of 8 count body builders – It’s a burpee with 2 bonus push-ups thrown in the middle, a great way to add some extra upper body work. 8) 60 seconds of split squat jumps – Take a low lunge position then jump up and quickly switch feet to land with your opposite foot in front. 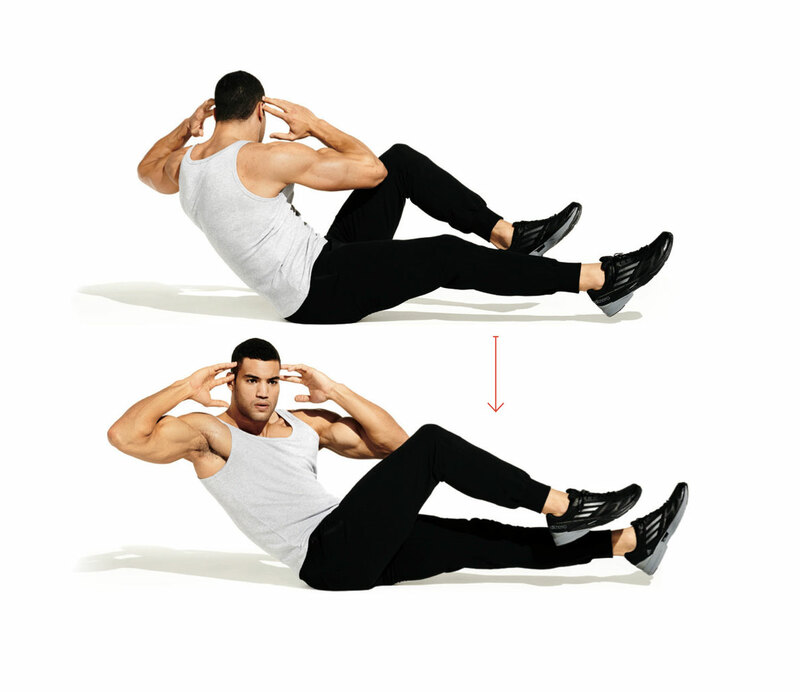 9) 60 seconds of reverse crunch with corkscrew – Add an alternating twist to your reverse crunch to add more oblique work. 10) 60 seconds table top crunch – Without pausing go straight in to the table top crunch from the reverse crunch for a 1-2 punch that will be sure to get anybody’s core feeling it. Equipment: 2 gallon containers of water that can be emptied out to desired weight (a gallon of water is approximately 8lbs), medium elastic tube (8-12lbs), and a mat. Warmup: Running in place or jumping jacks for 2 minutes. Foam roll tight muscles for approximately 3 minutes. Workout Instructions: Move through the following two circuits as prescribed. 3) 10 – 12 reps of tube curls – Tube anchored under one or both foot arches and curls done with both hands at the same time. 1.) 15 reps of reverse crunches – Lay on your back with hands on your sides or beneath your head. Bend your knees while keeping your feet flat on the floor. Slowly draw your knees towards your chest until the lower back just slightly lifts off the floor. Return your feet to the floor and repeat. 3) 12 reps of alternating push-ups > shoulder tap, do a push-up and while your hands are fully extended and without movement in any other part of the body, pick up one hand and tap the opposite shoulder, do the same with the other hand, then repeat the push-up. 4) 15 reps (each side) of kneeling shoulder press, kneel on one knee. Place a portion of your tube under the front foot, and hold one handle with the arm on the same side as the foot anchoring the tube. Place that hand on the front of its corresponding shoulder and proceed to press overhead and back down to the front of the shoulder repetitively. Rest 30 to 90 seconds after each set and complete 2 to 4 sets. Equipment: Jump rope (optional), dumbbell or kettlebell (optional), mat. Warmup: Perform 6-8 minutes of either jumping rope or jumping jacks as 45 seconds of work followed by a brief 15 second rest. Start the first 45 seconds at an easy intensity and for each successive minute go at a bit higher intensity. Workout Instructions: Do three rounds of the following exercises with up to 60 seconds rest after each round. 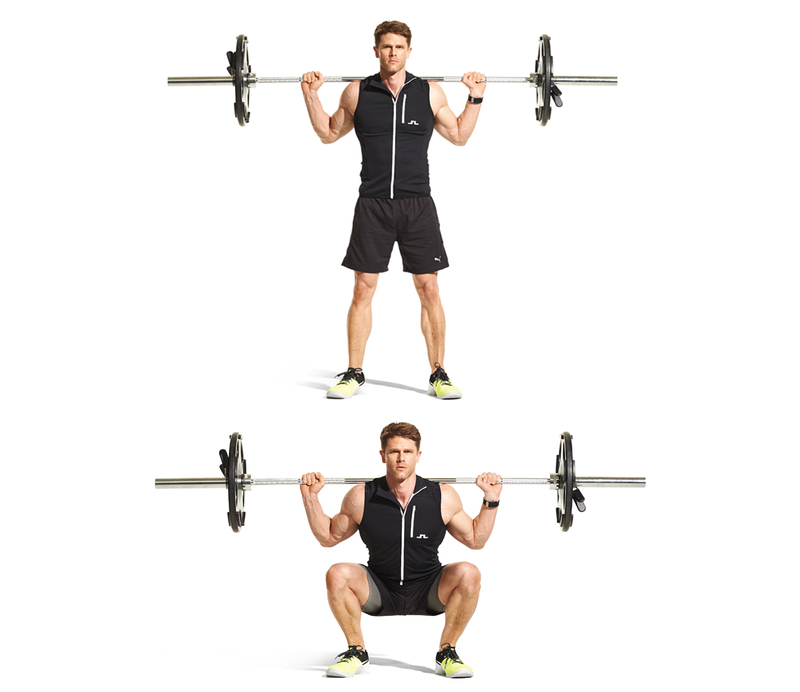 2) 60 seconds of prisoner squats – A body weight squat with your hands behind your head. Be sure to go as deep as you can and do as many reps as possible in one minute. 3) 60 seconds of V-sit crunches – If these become too difficult regress in to a basic crunch for the remaining time until you have completed one minute. 4) 60 seconds of push-ups – Start on your toes if you can, or from your knees if needed. If you are on your toes and you fail, drop to your knees to complete the minute. 5) 60 seconds of windshield wipers – To increase difficulty here add a reverse crunch when your legs come back to center. 6) 60 seconds of alternating lateral lunges – Be sure you focus on pushing through your heel on the outside leg to recruit your glutes. 7) 1/2 Turkish get-up – This is a great core exercise which also incorporates some upper and lower body. You can either do this with just body weight or holding a dumbbell or Kettlebell. 8) 60 seconds chair dips – If you are new to this exercise keep your feet underneath you more so your legs help your arms. If you’re looking for a greater challenge extend your legs straight out in front of you while keeping your hips back under your shoulders. Equipment: Mat, 2 small towels, 2 gallon-sized water bottles, medium elastic tube. 1) 10 reps of Burpee Jacks – Descend into push-up position by placing your hands on the floor and thrusting your feet out behind you. Quickly separate the feet as though doing a jumping jack and bring them back together. Draw your feet back towards your hands and stand up to complete the movement. Rest 30 to 90 seconds. Repeat the sequence for 4 sets. 1) 20 reps back lunges > front shoulder raise – Perform a lunge by taking a big step back and driving the knee of the back leg towards the ground. Simultaneously raise both arms from your sides to shoulder height. Stand back up and return your arms to your sides. Repeat with the other leg. 4) 24 reps of multi directional hops – Draw a cross on the floor with chalk or mark out with towels. Hop back and forth in front of and behind one towel 12 times, then hop side to side over the other towel 12 times. Rest 30 to 90 seconds. Repeat the sequence for 3 sets. Workout Instructions: Begin with 5 minutes of the cardio circuit. Once you have done that go straight in to the core circuit. Once that has been completed rest 20-30 seconds before repeating the circuits. Do 4 complete rounds of the circuit, or as many as time permits. You’ll burn a good amount of calories and get a great all around core workout. – Lateral quick feet – Move side to side with nice quick footwork, moving about 2-5 feet in each direction. 2) Once the cardio circuit is complete, go straight in to this core circuit. Perform each exercise for 60 seconds before moving from one exercise straight in to the next. Warmup: Run in place for 1 minute, jumping jacks for 30 seconds, high knees for 30 seconds. Stretch tight or overactive muscles as necessary. Workout Instructions: Move through the following three groups of exercises. 1) 10 reps (each side) bird-dogs – Position your body on all fours with your hands and knees on the ground. In one steady movement, lift your right arm and left leg until fully extended and in the same plane as your spine. Do not allow movement of the head, back, or hips as you do this. Repeat with the left arm and right leg. 4) 12 reps (each side) single leg standing side raise – Stand on the right leg and elevate the left foot just an inch above the ground. Take your bottle of water, emptied to the appropriate weight and hold it in the right hand. Steadily lift the bottle sideways, keeping the right elbow straight. Bring the right arm slowly back to your side. Repeat as stated and do the same on the left side. Rest for 30 to 90 seconds and repeat for a total of 4 sets. 5) 12 skaters > single leg balance with reach-down – Stand on the left leg and suspend the right foot an inch above the ground. Swiftly swing the right leg to the side and hop to the right a safe distance. Land on the right foot, come to a stop and balance. Steadily reach down towards the floor with the left hand bending at the hip to get lower to the ground. Come back to standing position and hop to the left and repeat. Rest for 30 to 90 seconds and repeat for a total of 3 sets. Cool down by stretching tight or overactive muscles as necessary.